Figure 48. 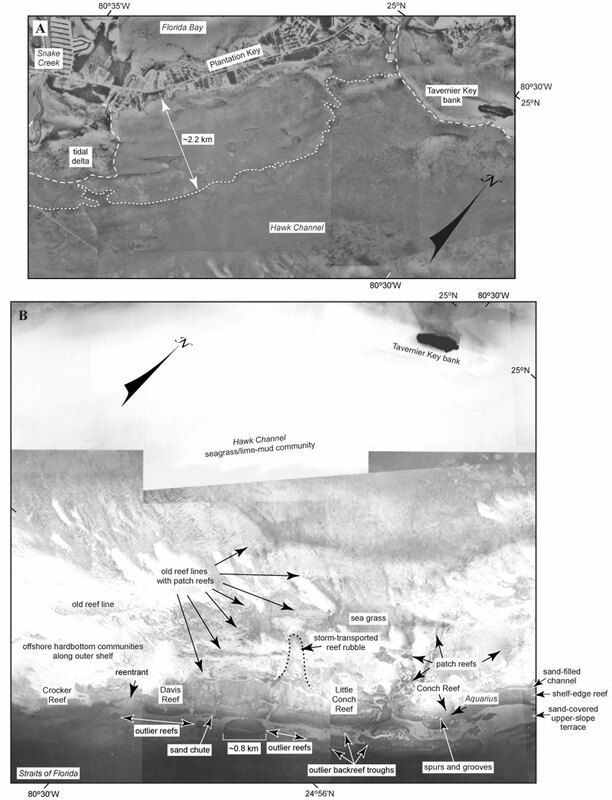 Photos show seabed features, habitat communities, and the effects of variable water-column conditions in the Tile 2 sector of the upper Florida Keys (from Lidz et al., 2003; Fig. 42B, Table 2). (A) When water clarity allows, the nearshore rock ledge on the seaward side of the keys is visible, here in the area of Plantation Key and Tavernier Key bank. Photo taken in 1975. (B) Composite of two sets of photos. Top half, taken in 1991, highlights the common problem of turbidity and low visibility in Hawk Channel. Bottom half, taken in 1975, shows offshore sand blankets and sand waves on the outer shelf along with grassy areas and numerous patch reefs that overlie coral-rock ridges. The mosaic indicates that outlier reefs occur seaward of the shelf margin in this area, but they have not been recorded in seismic-reflection data for various reasons. (a) The photos were not available at the time of the seismic survey, so researchers were not aware of the outliers and could not survey them. (b) Not knowing the outliers were there, the researchers did not run the research vessel far enough offshore to record the longer ones. (c) Small, short outliers such as those to the left of the oval outlier marked for scale (~0.8 km) are difficult to record unless by chance due to strong offshore currents pushing the vessel off course. The oval outlier is noted on navigation charts. Note location of the underwater habitat Aquarius seaward of Conch Reef.